This excellent tour around the southwest corner of Oregon begins and ends in Ashland. It travels in a big, counterclockwise loop, first heading up into the Cascades, highlighted by a visit to Crater Lake National Park. Then it heads west, down out of the mountains and across a few river valleys on its way to the coast at magnificent Cape Arago. After a memorable day on the coast, the loop heads back inland on some of the prettiest and quietest roads around…wonderful, dream-like cycling. These heavenly miles climb back through the Coast Range mountains and drop into the river valleys that will eventually lead back to Ashland. When we do this tour, we leave our extra car pool fleet at the Ashland YMCA for the week, and we use the Y for showers at the end of our final day. For more observations on this tour, read my column at BikeCal.com. 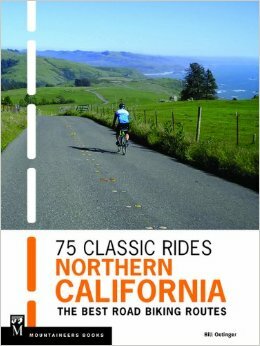 Think of it as a prologue: a little ride to do on your day traveling to Ashland. But note that although it is only 22 miles, it is mostly uphill, and if it’s as hot as it can be in this region in the summer, it can feel like more than just a short ride. Campsite on the shore of the lake has showers. First a rolling run through the mountain forest, then a nearly flat cruise around the wetlands at the north end of mammoth Klamath Lake. Finally, a long, gradual climb to the National Park…but not all the way to the famous lake. That payoff comes tomorrow. Camp has showers. 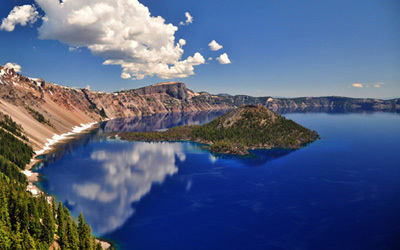 Now you get to visit the beautiful Crater Lake, but only after a long climb to the crater’s rim. Long route travels around the east rim and the short route runs along the west rim. Beyond the lake, both routes, rejoined, head downhill for most of the rest of the day, following the downstream course of the Umpqua River to a forest service camp on the bank of the stream. No showers…and the river is cold! More miles following the Umpqua downstream (but almost level on the road) before taking a quiet side road off the main highway, all the way to the outskirts of the city of Roseburg, biggest burg on the tour. Sneak through town on a secret, wooded lane and then get ready for some serious work. Two big climbs late in the stage hump up over two big ridges. A nice descent follows the first one and a smaller descent off the second summit leads to the overnight on the grounds of the high school in the little town of Camas Valley. Downhill (very gently) for the first 33 miles along the valley of the Middle Fork of the Coquille River. In the town of Myrtle Creek, leave the main highway for a delightful detour on little lanes along the meandering river for 12 dreamy miles. Back on main highways—but okay for bikes—for 13 miles, then peel off on a lumpy, rolling run out to the ocean at Cape Arago and Sunset Bay State Park….a magnificent piece of Oregon coastal scenery. Head south from Cape Arago along the ridge-running Seven Devils Road. Then descend to the dunes near the seaside resort of Bandon before turning inland and exploring another part of the Coquille River basin, back to and through Myrtle Creek. Finally, head further south to a nice county park in the village of Powers, along the South Fork of the Coquille. First 20 miles of gentle uphill along the South Fork of the Coquille and then another 20 miles of more serious climbing, first along the river and then up into the high hills. Those miles along the river are some of the most beautiful on this or any other tour. Really special. Once over that high summit, descend for 15 out of the next 17 miles, carving down the mountainside on a wild ride. The final 15 miles lump along over big rollers to the town of Glendale, where a shady patch of lawn awaits at the local high school. After a run up and over a medium-size summit near the start, descend to Wolf Creek and begin 15 miles of nearly perfect riding along Wolf Creek and Grave Creek. At the far end of that sweet run, cross the Rogue River and head upstream along the river for several miles. Then meander through the woods, bypassing the city of Grants Pass (well away from its development). Finish up with almost 30 miles of lazy rollers near the Applegate River, a great cycling region. Camp has showers, but the river is very inviting.